Pint sighs: An interview with Four Winds Brewing Co.
Just in case you're a craft beer drinker who's also living under a rock: 2013 is officially the year of the craft brewery in Greater Vancouver, with six new breweries opening plus three major expansions of existing facilities planned to take place before the end of the year. Much of the action is concentrated in the historic Brewery Creek (aka Mount Pleasant) neighbourhood in East Van - but that's not the only area we'll see new beer flowing from in the coming months. A bit about the brewers - how did the Mills family get involved in brewing? My dad Greg and I brewed our first batch of home brew in my parents' condo back in 2008 and upon finishing, we said to each other, "lets open a brewery!" Shortly after that, I left my job as a chef and was lucky enough to get a job in the brewing industry with the good folks at R&B Brewing. Greg continued to be an avid homebrewer and won a few awards with Vanbrewers. While working at R&B, I went to Chicago to study brewing at Seibel technical institute. What's the story behind the brewery? Where did the idea/concept come from? We are fortunate to be a family-owned and operated brewery. My dad Greg and I have been working on getting this going for about a year now, and my brothers Sean and Adam have come on to join us in construction to bringing this idea to fruition. Its been a collaborative effort from day one; there have been many hours spent discussing and "sampling beers". 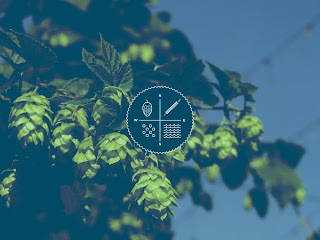 We always wanted to brew the beers we love to drink so that is first and foremost, after that I think we focus on enhancing the customer's experience drinking our beer by having unique packaging design and a beautiful tasting room. Four Winds is an old term used to describe gone or going in many directions, as a brewery that is passionate about so many different styles of beer we found it quite fitting. How would you describe your beers? Well, three of our core year-round beers are definitely west coast inspired (excluding our saison), but we will also be brewing some Belgian and German beers, or at least our version of them. We have just started a barrel program as well, so look for some Brett ages and sour beers in the future. What's your favourite thing you've brewed so far? I would say our saison, it was the first beer I brewed on our system and it was stressful as hell but I just love the simplicity of the recipe and how that that magical Dupont yeast can turn it into such a complex yet drinkable beer. What beers will you launch with? We are launching with our saison, pale ale and IPA - our pilsner will follow shortly after. Any plans for barrel-aged beers? Cask beers? Yes! As I mentioned before we have a barrel program on the go and I plan on aging a portion of our first batch of saison in wine barrels with brettanomyces . A long aging sour is soon to fill the rest of our 17 barrels. We will also be doing some cask beer. What do you think will make Four Winds stand out from other local breweries? Well, time will tell, but I think we stand apart because of our attention to detail and our goal of artistic expression, be it our packaging and tasting room or our beers. 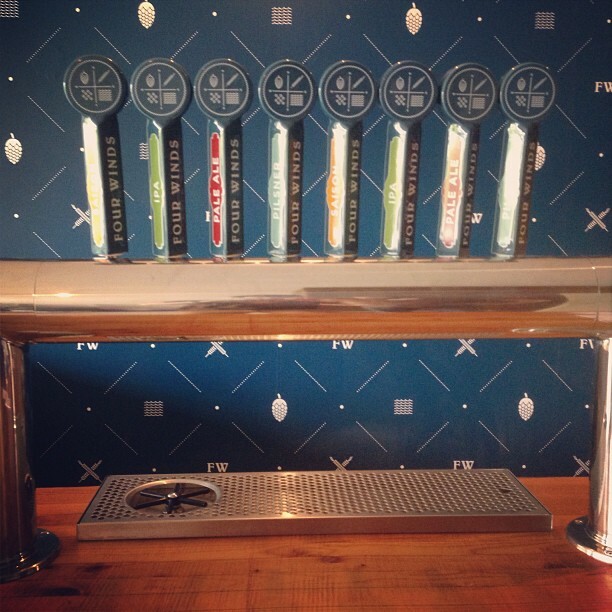 Will we be able to get your beer on tap around town, or in bottles at liquor stores? Ya, we will be on tap around town at all the best craft beer bars and restaurants. We are also hoping to have a good presence in our own neck of the woods, so look for our beers in Richmond, Ladner and White Rock in time. Our first batches will be sold as draft. Our bottling line is being built as we speak, we are hoping to have product available in 4-packs by mid-summer. 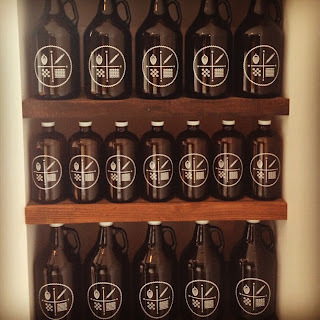 Will you be filling growlers? What sizes? Yes we will be filling growlers! 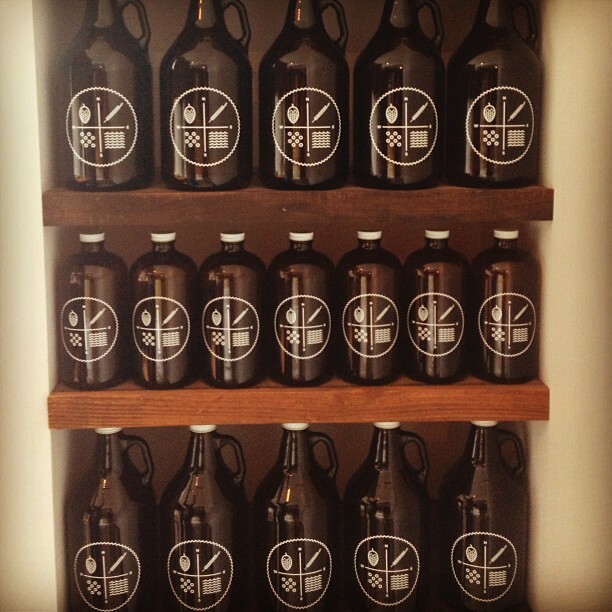 We have both 2L growlers and 1L growlitas. We decided to invest in a growler filler so that the customer is bringing home the best and freshest quality beer with very little waste on our end. Does the brewery have a tasting room? What about tours for the public? 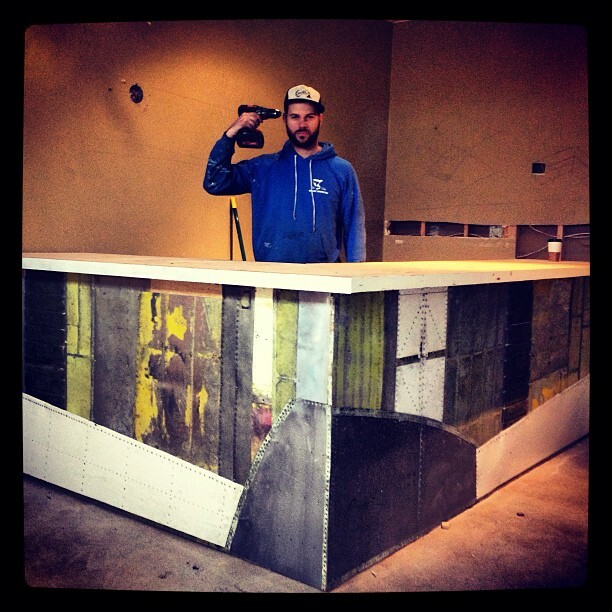 We do have a tasting room, and it's something that we have been taking great pride in building. My brother Adam has designed and built our tasting room from the ground up. It's a beautiful space, you have to come and check it out. We will be doing tours but as of right now we don't have anything set for a schedule. What's been the biggest challenge so far with opening your own brewery? The biggest thing is accepting it's gonna cost more and take longer, haha. What's been the best thing so far about opening up your own brewery? Its cheesy, but being able to create, work and spend time with my dad and two brothers. Oh, and also brewing the beers I've always wanted to brew. Now that yours is almost complete, what advice would you give to someone wanting to start his or her own brewery? Best advice would be get your hands dirty, do as much on your own as possible and plan, plan, plan because nothing goes as planned. Just that we are so grateful to be a part of the BC craft beer scene at such an important time. We look forward meeting our customers, be it at our brewery, at pubs or at beer events. Thank you in advance! Oh - and to thank our friend and our fantastic artist Andy Dixon. 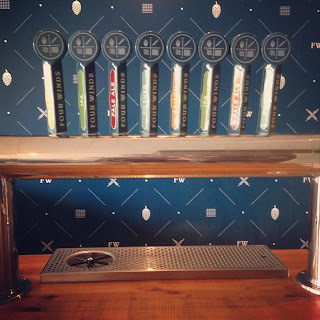 Four Winds Brewing is hosting an open house on June 1st at their Delta brewery and tasting room. They will have sample glasses/flights, sleeves and growler fills for sale, plus an exclusive cask of Douglas Fir tip IPA. More information on the Facebook event page. 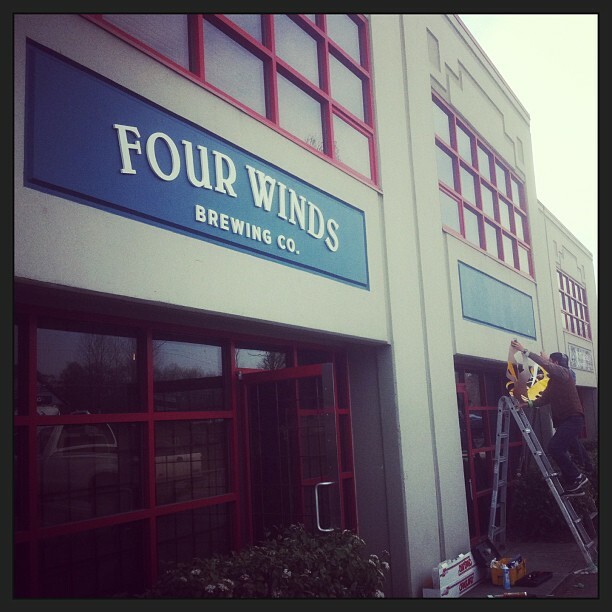 To keep up-to-date with Four Winds Brewing, follow them on Facebook, Twitter and Instagram.